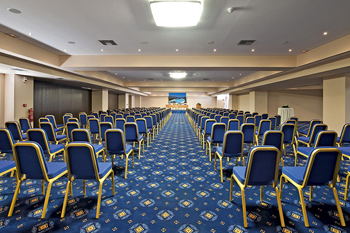 CHANIA, THE IDEAL DESTINATION FOR INCENTIVES, CONFERENCES, CONGRESSES, MEETINGS, BUSINESS TRAVEL, INTERNATIONAL CULTURAL AND SPORT EVENTS. Chania is at the westernmost part of the island and occupies an area of nearly 2400 square kilometers. The terrain is mountainous and the vegetation dense with oak, pine and chestnut trees. The steep mountains, home to the famous Gorge of Samaria come down to the sea to form beautiful beaches, like Aghia Roumeli, Sfakia and Sougia. 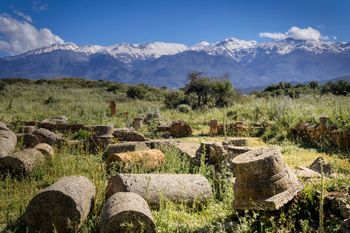 In the north of the Prefecture, protected on three sides by the White Mountains is the large plain of Chania, where olive trees, orange groves and vines grow abundant. After the collapse of the Minoan palace culture, Chania grew into one of the island's most important cities- well enough know for its citizens to warrant a mention in Homer's Odyssey- and remained so through the classical Greek era. When Rome came in search of conquest the city mounted a stiff resistance prior to its eventual capitulation in 69 BC, after which it flourished once more. In early Christian times, Kydonia was the seat of bishop, and under the protection of Byzantium the city flourished along with the island. As the Byzantine Empire became increasingly embattled, however, so its further outposts, Kydonia (and Crete) included, suffered neglect. When the Venetians finally won it back they acted quickly to strengthen the defences, turning the city, renamed La Canea, into a formidable bulwark in the west. In 1645, after a two-month siege with terrible losses, Chania fell to Turks. It was the first major Cretan stronghold to succumb, becoming the Turkish island capital and seat of the pasha. For the rest, it is a history of struggle: for independence during the nineteenth century, then in resistance against the Germans in World War II. During World War II, Chania suffered severe bombardment, this destruction eventually compounded by a fire, which wiped out almost everything apart from the area around the harbour. In the post-war period, the town was rebuilt and sprawling, traffic-congested suburbs now encircle the ancient core. The arrival of tourism has inspired the will- if not the resources- to save and restore much of the city's crumbling architectural heritage, and Chania is currently enjoying a period of peace and prosperity unrivalled in its modern history. Chania, as any of its residents will tell you, is the spiritual capital of Crete, even if the title is officially bestowed on Heraclion. Chania, the island's second-largest city and former capital, is the site of the Minoan settlement of Kydonia, which archaeologists believe was a palace site and an important town. 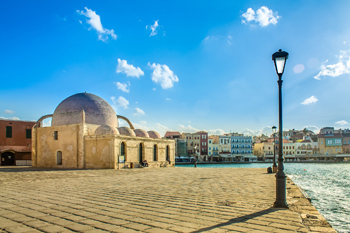 The lovely Venetian quarter of Chania that surrounds the Old Harbour is one of the island's best attractions. Many old buildings have been restored in recent years, with some of them having been converted into very fine accommodation, while others house chic restaurants, bars and shops. Even though the town itself is beautiful enough to keep a lot of tourists, the best attractions are around it. One of these is the famous and heavily trekked Samaria gorge. 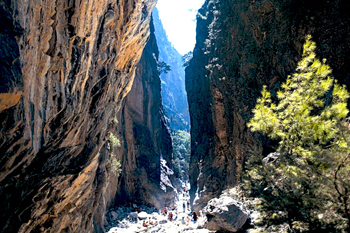 Despite the crowds, a trek through this stupendous gorge is an experience to remember. The 18km-long gorge, the longest in Europe, begins just below the Omalos plateau carved out a river. Its width varies from 3m to 150m and its vertical walls reach 500m at the highest point. The gorge has an incredible number of wildflowers and is also home to a large number of endangered species, including the Cretan wild goat, kri-kri. Others include At 1.5 km S of Chania there is Nerospilia, a cave with stalactites and stalagmites, the monasteries of Yiouvernetos and Aghia Triada at 18 km N of Chania and Frangokastello at Sfakia, 73 km SE of Chania. Each church is devoted to a particular saint and that saint's name day is usually celebrated with a Panagiri (festival), and a religious service. On January 6th, Epiphany is celebrated throughout Crete when the Blessing of the Waters takes place. A cross is thrown into the sea, lakes or rivers and retrieved by swimmers who are then entitled to good luck. The event is particularly spectacular in Chania old harbor. 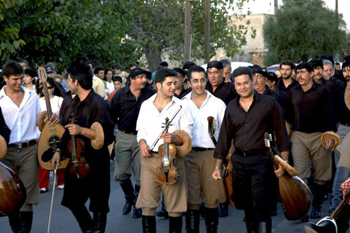 On May 21st, in Chania and Rethymnon they celebrate the anniversary of the battle of Crete. The permanent population - fast expanding into hills and coastal suburbs - always outnumbers the tourists and visitors. It all adds up to a city worth getting to know, where visitors almost certainly stay longer than intended, making use of plentiful accommodation, excellent markets, stores and nightlife, and most other facilities visitors could hope for. The Cretan folk tradition which is marked mainly in weaves, ''tsevredes'', carpets, blankets etc. and expresses the feel of beauty and artistic mood of the people of Chania. Simple village women, but also organized associations, produce weaves from silk or wool. Handicrafts from glass, wood and metal, along with pottery, woodwork and metalwork workshops. Particular is also the art of producing boots ''stivania'' at Skridlof road in Chania where the smell of processed leather is dominant. Also Cretan knifes are characteristic with the witty four-lined poems. 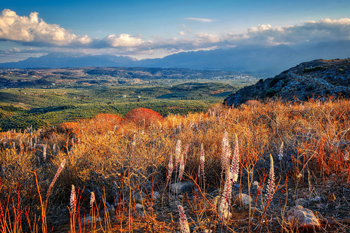 The earth's topology and the climate make the area of Chania a paradise for thousands of plants and animals. The climate is relatively mild, Mediterranean. During the fall and winter months north and northwest winds dominate, while in the summer the ill winds make it enjoyable. But the divine gift of the eternal sunshine allows one to start their vacation from March and end it at the end of October. Chania has the largest amount of water in Crete (65%), and for this there is rich vegetation of plants and fruitful trees (citrus trees, olives, vines etc.) as well as semi-tropical plants. The fantastic beaches of Chania always win the ''blue flags'' of Europe and are accessible for all ages throughout the year. Chania prefecture has two outstanding beaches on the west coast, at Elafonisi in the southwest and Phalasarna in the northwest. 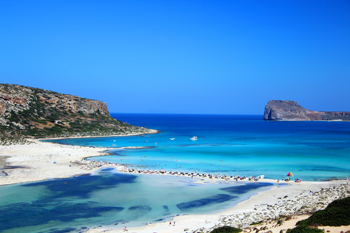 One of the longest, uninterrupted sandy beaches is at Georgioupolis between Rethymno and Chania. The region offers an unlimited variety of sports and leisure activities, from regular excursions and sightseeing trips to adventurous trekking and mountaineering. The sharply contrasting natural beauty of the area features steep, rugged terrain, deep gorges, vast plateaux, dense oak forests, long sandy beaches and secluded coves. All this, together with clear blue skies and seemingly endless sunshine over 300 days a year, offers unique opportunities for recreation and relaxation. Athletic competitions are held at Chania during the last week of May, as part of the festivities for the anniversary of the ''Battle of Crete''. The competitions are organized by the Athletic Association of Chania and the Ministry of Athletics. There are all sorts of night clubs at Chania, where people dance to the sounds of the latest hits until the early morning hours . Many places offer a cozy atmosphere, where one can have a drink and listen to live music. A walk at nearby Paleohora can end with drinks at its fashionable bars. 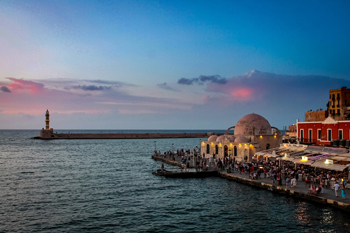 Picturesque any time and season of the year, Chania's Venetian port is attracting both visitors and locals for its beauty and variety of entertainment to suit all tastes and demands. 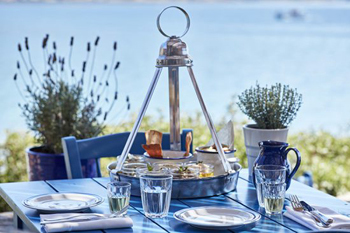 Already from the ancient times of the Minoan civilization, the inhabitants of Crete seem to be aware of the value of food like olive oil, olives, green vegetables, herbs and many other products that are found in the Cretan soil in great abundance. During their history of many centuries Cretans based their diet on those products, a fact evidenced by cooking recipes preserved to this day. The Municipal Market of Hania, a brilliant cross-shaped building completed in 1913, has many local products, such as chestnuts, honey, bread, bananas, ''eptazyma'' toasts and the famous Cretan drink of ''raki'' or ''tsipouro''. There are also shops selling ceramics, leather items, embroideries, woven-fabrics and hand-made jewellery. Top Chanas is a good place to purchase authentic Cretan blankets and woven- fabrics. At ''stivanadika'', one can find all sorts of leather products, belts, bags and ''stivania'', the peculiar Cretan boots. The cutlery shops provide a wide variety of genuine Cretan knives, an exquisite souvenir from Crete. Near the market, there are pharmacies, newspapers stores and banks, while the main streets across from the market sport modern stores, banks, car-rental places and the variety of shops usually found in cities. The area of Chania, due to its natural beauty and variety of sights attracts many tourists from all over the world. 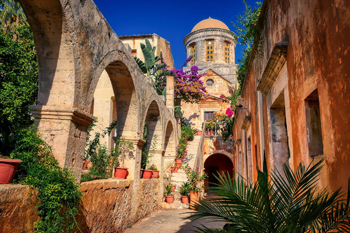 The city also accepts visitors who are interested in economical activities in the area, as well as scientists and educators, who are interested in historical files, historical monuments and museums or are interested to visit the Technical University of Crete, which is an important research center.